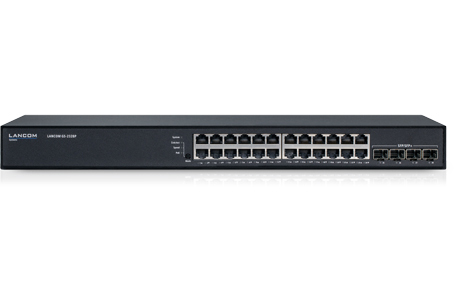 This fully managed switch is the high-performance basis for powerful network infrastructures in any area of application. Supporting Power over Ethernet on all of its 24 Gigabit Ethernet ports and supplying a total of 370 watts overall, it offers enough power to simultaneously operate PoE devices on all of its ports. 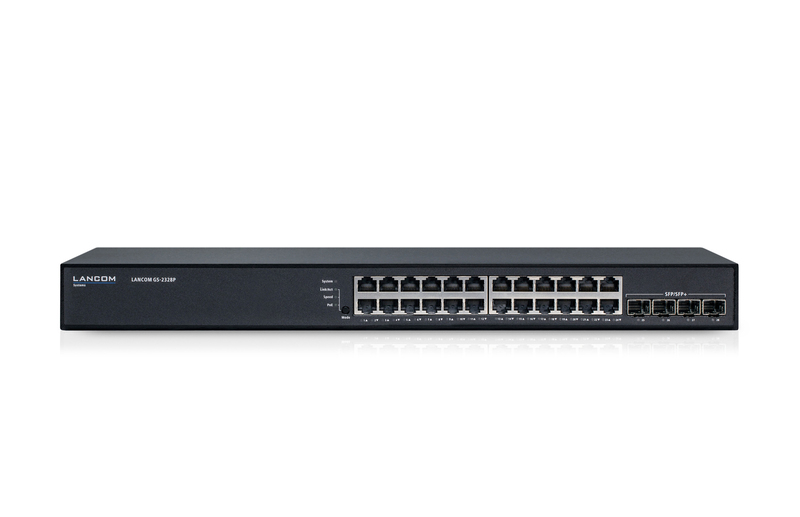 With an additional 4 SFP+ ports supporting transmission rates of up to 10 Gbps, this switch is the ideal solution for the internal networking of further switches. Orchestrated from the LANCOM Management Cloud, it is configured efficiently and automatically by SD-LAN. The LANCOMGS-2328P is equipped with 24 Gigabit Ethernet ports and 4 SFP+ ports supporting transmission rates of up to 10 Gbps. With a data throughput of 128 Gbps on the backplane, it offers full performance even under maximum load. This makes the switch a high-performance basis for modern network infrastructures in any industry or field of application. As a high-performance PoE+ switch, the LANCOM GS-2328P supplies power to PoE devices such as IP phones, access points and surveillance cameras, without the need of any additional power supplies. It supports the two Power-over-Ethernet standards IEEE 802.3af and IEEE 802.3at (PoE+), with an overall output of 370 Watts. This makes the GS 2328P ideal for efficiently supplying power to the increasing number of PoE devices with high power requirements. 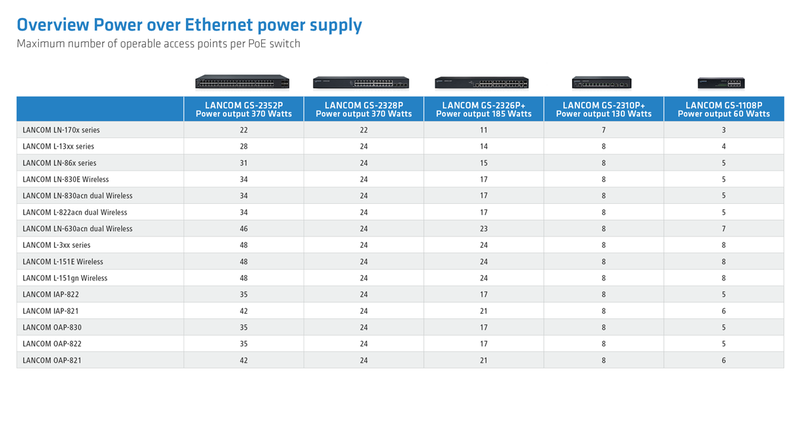 The LANCOM GS-2328P features Energy Efficient Ethernet technology. Thanks to numerous power-saving features as per the IEEE 802.3az standard, ports that are not transferring data are switched off automatically. This valuable feature saves precious resources. The LANCOMGS-2328P features 4 SFP+ ports supporting speeds of up to 10 Gbps. What's more, these ports can be bundled by LACP as per IEEE 802.3ad to achieve speeds of up to 40 Gbps. Your network offers noticeably higher performance, greater reliability, and even more speed. The LANCOM GS-2328P stops rogue clients from gaining unauthorized access to the network. This is ensured by secured access control on all ports as per IEEE 802.1X (port-based, single, multi, and MAC-based). Secure communication protocols such as SSH, SSL and SNMPv3 mean that the LANCOM GS-2328P is ideal for the professional remote management of networks. The switch also supports the TACACS+ protocol for authentication, authorization and accounting. This optimized solution promises maximum security for multi-site network management and monitoring. Thanks to the dual-stack implementation, the LANCOM GS-2328P operates in pure IPv4, pure IPv6, or in mixed networks. This means that it can be managed via both IP address standards, which makes it fully future-proof. Every day, our customers rely on products manufactured in Germany to the highest standards of quality. These quality standards also include fast help, just in case things should go wrong. 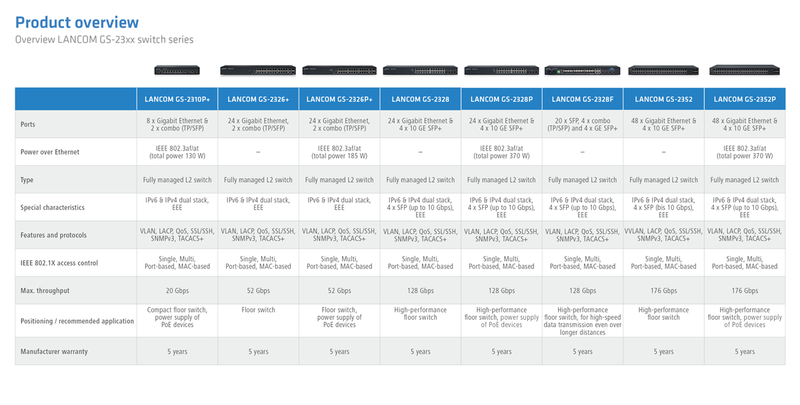 This is why the LANCOM GS-2328P comes with a standard warranty of 5 years.